The Laguna Foundation invites young explorers to join us this summer to learn more about the Laguna! CAMP TULE CANCELLATION POLICY: If you have registered and need to cancel, please notify us as soon as possible so that others may attend. Cancellations received more than 30 days in advance of the event date will receive a refund minus a $25.00 processing fee. Cancellations made between 30-7 days in advance will receive a 50% refund. We are sorry but refunds cannot be given on cancellations made less than 7 days in advance. 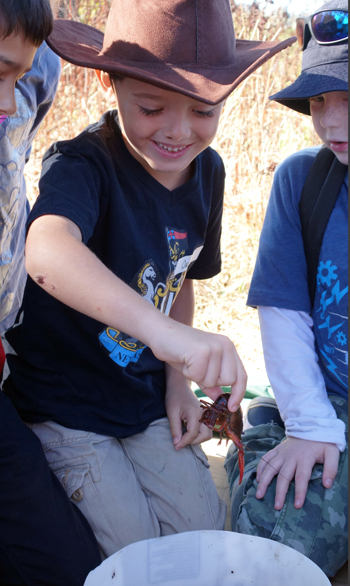 Laguna Explorers: Camp Tule... a great place for 6-9 year old children to explore, make new friends, grow, and have a bit of special summer fun while taking delight in the wonders of the natural world! Located at the Laguna Environmental Center, Camp Tule is a nature-based day camp for children aged 6-9 years. Each camp day (9-3, M-F) will be spent outdoors and filled with exploration, discovery, creativity and nature games all designed to connect children to the environment. Children attending camp will learn about the native plants and animals of the Laguna de Santa Rosa ecosystem in a supportive and encouraging environment. We aim to foster wonder in children and for every child to delight in the world we live in. Camp Tule is a place where children grow creatively, look closely, and spend structured and unstructured time exploring and playing in nature. All the Camp Tule adventures begin and end at the LEC and the days are filled with nature hikes, art, stewardship, and lots of joy! Now Hiring: Intern Counselors for Camp Tule! Do you know a young adult who would love the experience and benefit from being a paid intern at Camp Tule? We are looking for bright, talented, enthusiastic and skilled high school juniors, seniors and college- age interns who will bring their special skills to the Camp Tule environment and be role models to the campers. Please invite them to review the Intern Counselor position announcement and application here. Applications are currently being accepted and reviewed. Deadline to apply is June 1. Have a look at some of the fun from 2018. We hope you will join us this year!